Off in Ballard, we had a slice of pizza at Snoose Junction. Also on offer were snow cones. "Would you like a shot with that?" 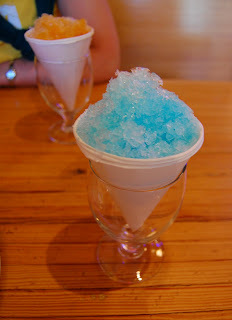 In my experience, the answer to that is rarely No, so we had an orange coconut snow cone with dark rum, and a (virgin) blue raspberry snow cone. Our waitress had to saw a new block of ice, and mount it into a frightening machine that shaved the ice. They were delicious, and complemented the pizza nicely.